POSTPONED UNTIL A LATER DATE. CHECK BACK FOR NEW DATE. 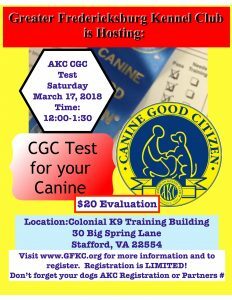 NEW CGC/TRICK DOG TESTING DATE offered by GFKC! Deadline for registration is Wednesday, September 5, 2018. Another opportunity to test your dogs skills by passing the CGC and/or Trick Dog test! Indoor heated location at Colonial K-9! Please visit GFKC.org to register and pay. You may pay by credit card via the website or mail check to: GFKC, PO Box 602, Fredericksburg, VA 22408. If paying for Trick Dog, please use CGC testing to pay and note trick dog testing where applicable.